The inverse transform can then be computed using (1) or (2), depending on the circumstances, in at least two ways. If, perhaps from a previous decoding of (1) with a known spike train, we know K, we can use our decoding method, or another standard method, to solve (2) in one step to find from a novel R(t) the corresponding A(t). 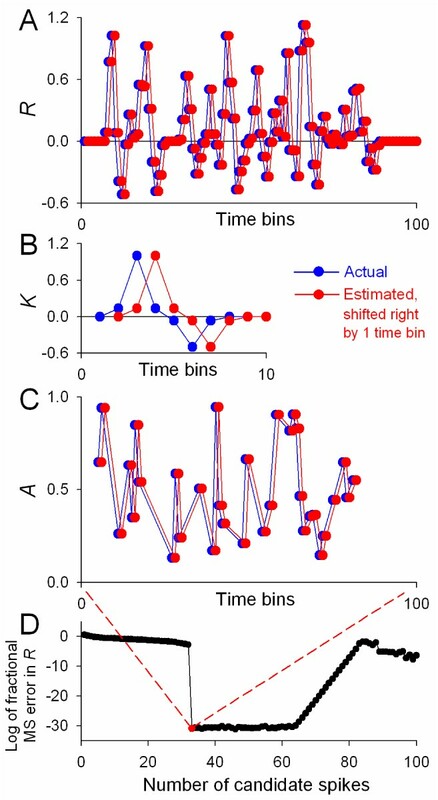 In datasets with relatively low noise and low spike density, the spikes can then be identified simply as occurring in time bins where A(t) ≠ 0 or, in practice, where A(t) exceeds some threshold. Otherwise, A(t) still reflects the input presented by the spike train, albeit in a more diffuse way. A more challenging problem occurs if K is unknown. Then we can decode (1) to find K and A as previously [1, 2], except iteratively, starting with the assumption that each time bin contains a spike and progressively deleting spikes from those bins that have the smallest values of A. Figure 1 shows an example with synthetic data where this method simultaneously found K and A, reconstructed R, and identified each spike in the train, perfectly. We have used these methods successfully with synthetic data and with the real transforms from motor neuron spikes to postsynaptic membrane voltage and muscle contractions in the cardiac system of the blue crab . Computation of the inverse transform illustrated with synthetic data. A-C, blue: K and values of A at 33 random spike times were used to construct the overall response R. A-C, red: the corresponding solutions found by the iterative decoding of (1) with progressive deletion of candidate spikes. The corresponding blue and red points are in all cases identical; the red points have therefore been shifted right by 1 time bin for visibility. D: log of the fractional mean square error in the reconstruction of R.
Supported by NIH grants NS058017, NS41497, GM08224, and RR03051.